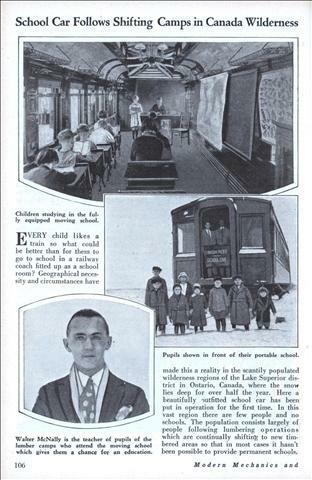 Every child likes a train so what could be better than for them to go to school in a railway coach fitted up as a school room? Geographical necessity and circumstances have made this a reality in the scantily populated wilderness regions of the Lake Superior district in Ontario, Canada, where the snow lies deep for over half the year. Here a beautifully outfitted school car has been put in operation for the first time. In this vast region there are few people and no schools. The population consists largely of people following lumbering operations which are continually shifting to new timbered areas so that in most cases it hasn’t been possible to provide permanent schools.